Ann Arbor Public Schools has long been known for its dedication to the arts. Now theater classes are expanding at every level, right down to two elementary schools. Beginning this school year, AAPS staff includes a theater teacher teaching K-5 theater at Burns Park and Lawton schools. The hope is to expand into more elementary schools in the future. Elementary theater teacher Jayme Kelmigian (see video above) came to AAPS last year from New York, where she had worked on “Hamilton” but missed working with and building student voice through theater. Jayme Kelmigian (far right) says her elementary students at Burns Park (shown here) and Lawton love the chance to express themselves. Over the summer she wrote the district’s K-5 theater curriculum and procured the materials she needed to launch this program. Fine Arts Coordinator Robin Bailey is excited about the new opportunities now available to an increasing number of children from K-12. 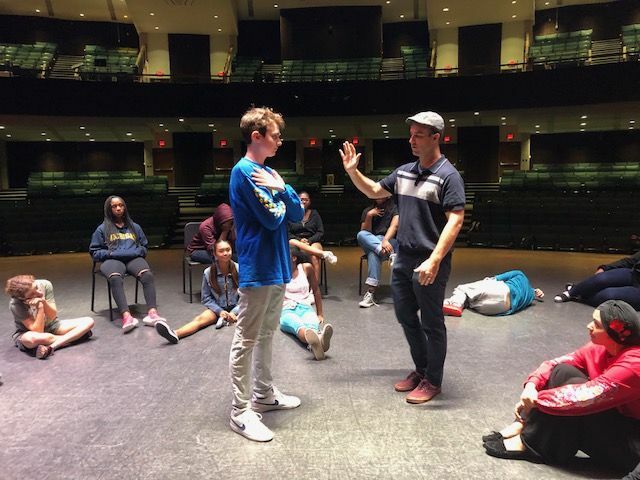 Each high school now has an AAPS theater teacher teaching acting, theater production, and screenwriting classes during the school day, enabling students to take classes and explore “front of the stage” and “back of the stage” opportunities. These initial experiences build confidence in students to pursue participation in Theatre Guild after-school programs, creating a more diverse student body participation district-wide. Quinn Strassel teaches theater at Huron High School. AAPS now has a theater teacher teaching theater classes at Tappan, Slauson, Scarlett, and Forsythe Middle Schools and would like to expand to Clague in the future.